In today’s economy it’s critical for me to teach my children sound financial principals. Money Savvy Generation helps parents like me teach children about personal finance with products that are not only educational but fun too. This holiday season, Money Savvy Generation has a great selection of gift ideas for kids of all ages including young children to teenagers. The Money Savvy Pig bank is really neat and has won several awards including Creative Child Magazine Preferred Choice award in 2008 and the Parents Choice Gold Award. It is easy to see why because this Money Savvy Pig is different than any other piggy bank I have ever seen. My four year old daughter loves to collect coins that she finds all over but she doesn’t understand the concept of a piggy bank (she wants to carry her coins around with her). 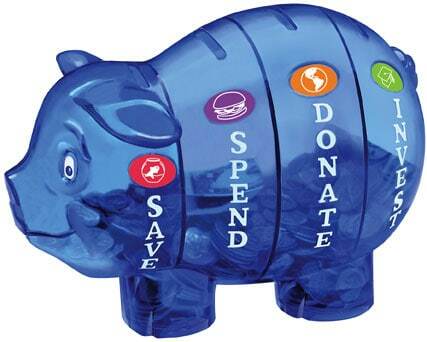 The Money Savvy Pig bank is divided into sections for “Save, Spend, Donate and Invest”. Of course at her age I don’t expect her to understand the entire concept but I did see a glimmer of understanding when I explained the save, spend and donate concept to her and my five year old son too. Now, instead of carrying her found change around with her she asks if she can put it into the right spot of her Money Savvy Pig bank. It even has goal setting stickers and I love how this is an interactive opportunity for parent and child to work together and teach about personal finance. It even includes an easy to follow instruction sheet for older children. There are several colors to choose from and at $16.99 the Money Savvy Pig is a real bargain. One of the ways that our family has learned to live on one income is by having a garage sale twice a year which we save to fund our family vacation and also puts money aside from the proceeds to purchase later in the year for holiday gifts. That way we don’t go into debt at the holidays and have sold items that we don’t use or need in the process. My children have always been involved in our garage sales to some extent by selecting toys that they want sold in the sale. 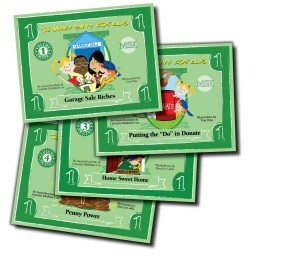 Money Savvy Generation has an excellent series of books for children ages 4-11 that really take it to the next level. For example, Garage Sale Riches (ages 7-12) is a fun teaching book that also teaches a valuable lesson about spending and saving. My children and I are enjoying “Putting the “Do” in Donate”, “Home Sweet Home” and “Penny Power.” What I appreciate most is that my children are learning and having fun in the process. I believe that this is the best way to teach these critical finance skills to young children. The Money Savvy Book Volumes are $12.95 each or can be purchased as a bundle package for only $41.44 which will save you 20%! 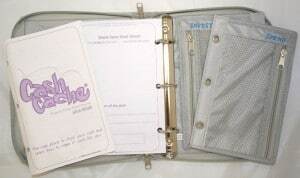 For teenagers, I was very impressed with the Cash Cache which a personal organizer for beginners. In fact, this would be an especially good present for a college student too. The Cash Cache features a 36 page handbook which discusses all the aspects of personal finance including goal setting, budgeting, sections for savings and checking accounts, credit cards, saving, spending, donating, investing and even the stock market. There are handy pockets to keep a calculator, coupons, reward cards and other financial documents. It has numerous organizing finance templates and has a privacy lock to give your teenager a sense of confidence and independence. I would have loved to be given one of these when I was a teenager and started working at age 15. At $21.99 this is a “priceless” gift for any young adult. Money Savvy Generation has loads of valuable information and tips about personal finance on their website. “Helping Kids Get Smart about Money” is such an important mission statement and I am so glad that I discovered Money Savvy Generation as my children learn these valuable lessons. To purchase any of the items in this review or to learn more with valuable sections for parents, educators and more head over to Money Savvy Generation. Exclusive savings offer for Simply Stacie readers! You can save $5.00 off shipping on orders of $50+ of merchandise when you use coupon code BlogSS1210. The coupon is valid through December 31, 2010. In your Open Sky Store my favorite product is the Fitness Coffee. Thanks for another great giveaway! Another product I like is the Card Guard. At this time of year gift cards abound and with the mini registers that come with this product it will make it easy to keep track of gift card balances. Follow Susan Beacham on Twitter @MamaHendo3. Simply Stacie FB fan (Laura Grassie Henderson). Money Savvy Generation FB fan (Laura Grassie Henderson). My favorite item from your store is the HearthSoft Protective Hearth Cushion. Signed up for MSG newsletter.